It was a community arts and activity center known as "The Galaxie." I had seen their website in the past but it wasn't until I set foot in the place that I realized what a fantastic facility The Galaxie really is. 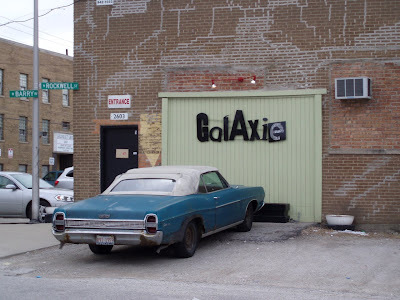 The Galaxie is a converted warehouse/industrial building which now houses a community multi-use space. While I was at The Galaxie they had dance classes and martial arts classes in addition to the open figure drawing session for which I was modeling. The building has wonderfully high ceilings and excellent light. The Galaxie exists to provide a place for the promotion of the arts and artists. This includes performance art as well as the more traditional fine arts. I was quite impressed with the range of activties covered at the Galaxie. I feel fortunate to have had the chance to be involved with the goings-on at The Galaxie. The Saturday Morning Figure Drawing sesson held at The Galaxie is moderated and organized by Megan Gallagher, an independent artist. Allison Rae Butkus The Galaxie's creative-in-residence charged with securing models for the Figure Drawing session which takes place every Saturday at The Galaxie from 9:30am to 12:30pm. Attending artists need to supply their own paper stock and drawing supplies. Drawing horses are provided by The Galaxie. Free coffee is also available to those who like a little caffeine with their art. Photo courtesy of M. Gallagher. I really liked The Galaxie and I really enjoyed modeling for the Saturday morning figure drawing group. I hope to be back at The Galaxie soon. Your blog makes interesting reading because I've been a male figure model in the Cincinnati, OH region since 2004 and I've never spoke to another male model. It's nice to hear another's perspective on it. Are you still doing it? Yes- I am still modeling. I do it full-time now. I got laid off from a corporate job in March and have decided to make artistic endeavor my vocation. It's not an easy way to make a living but I enjoy working with artists and seeing the art that results. I probably model far more than any other males in Cincinnati but it's nowhere near enough to make a living at. Like you, I do it for the love of art and extra income but it's certainly not a lucrative profession, especially for males. Sounds like you get a lot of gigs up there, though. That's what reliability, professionalism, and experience will do for you.